How To Grow Your Own Organic Food – Pallet Gardening is The Answer! 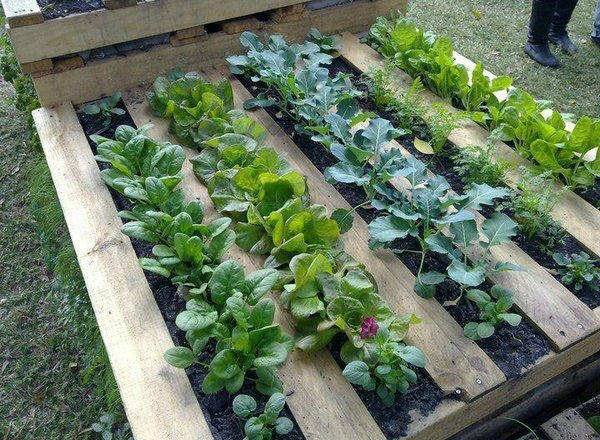 This year, we recommend you to try pallet gardening for growing your vegetables. You will need a wood pallet, several seeds, and some good-quality soil. A raised bed pallet garden can be built in several ways. You will finish it in a few days, and there is no need to invest much money. “Look for a pallet that has HT stamped somewhere on the pallet. This means the pallet was heat treated, or kiln dried as opposed to chemically treated. Because you can never be sure that chemicals were stored on an old pallet or that there is some sort of bacteria lurking inside the recycled pallets, I would scrub the wood down with some bleach and soapy water and let it dry out before using it to plant anything. Raised beds are much more useful, as they reduce the need for poor native soil, as well as weeds, and extend the planting season. The roots grow easily since the soil is not compacted. Also, due to the use of compost and close plant spacing, raised beds provide higher yields than conventional row gardening. While weeding, you can sit on the edge of the beds, if it is properly built. It can be up to 36″ high, but in most cases, gardeners make them 11″ high, which is the height of 2 stacked 2″ x 6″ boards. In the case of a high-quality soil, the roots go down deeper and thus access more nutrients, therefore, the beds will be only 6″ high. You can also use cross-supports in beds taller than 18″, or longer than 6′, as the weight of the added soil might force the plant to bow outward. Additionally, you should consider the requirements depending on the types of vegetables you plant to grow. In some cases, you might need to build the sides of the bed higher. You’ve Been Throwing Away Avocado Seeds Because You Didn't Know That They Fight Cancer And Regulate Thyroid Disorder!